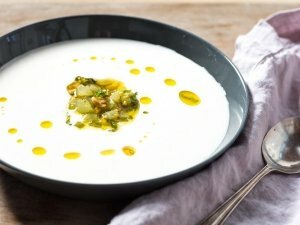 Ajo blanco, sometimes called “white gazpacho,” is Spain’s other famous chilled summer soup. Made with bread, almonds, garlic, olive oil, and a splash of vinegar, then topped with refreshing green grapes, it’s another perfect warm-weather bread soup, and it just happens to be 100% vegan. Soak the bread in a little water to soften it. Serve topped with the fruit or ham and a drizzle of oil.